Enjoying online music can be a pleasant way to spend your free time, but sometimes your Internet connection might not work, thus rendering you unable to access your favorite content. Fortunately, you can rely on software solutions, such as What-U-Hear Track Recorder, that can help you record audio tracks and enjoy them without needing an Internet connection. Perform audio recordings on your computer using various input sources by relying on this lightweight application that comes with a simple interface. It's very easy to use, and is suited to professionals and novices alike. This program comes with a simplistic user interface that integrates its core functions in a neatly manner so that you can operate them in an effortless manner. It does not feature any additional configuration menu since all of its functions can be easily accessed from the main window. 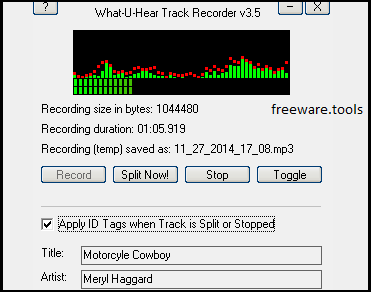 Given to its simplicity, many users can benefit from What-U-Hear Track Recorder's functions, regardless of their computer operating skills. However, the lack of any help documentation source might be unfortunate for users that might get stuck while operating it. This application can help you record your favorite audio content in an easy manner, by allowing you to choose the most suitable input source, be it your microphone or the line-in. Performing a new recording can be achieved by clicking either the “Record” button or the “Split Now!” one. The former starts a new recording while the former stops the current recording and creates a new one. This feature is useful when you want to record different tracks from an audio mix. After recording your desired content, you can choose between multiple output formats and quality profiles. Some of the supported formats are MP3, WAV and OGG, while encoding can be done between 64 and 320kbps. Therefore, you are provided with a wide variety of options that you can choose from. To sum it up, What-U-Hear Track Recorder is a lightweight application that allows you to record audio tracks on your computer in an efficient, convenient manner. It comes with a simple interface and it encompasses intuitive functions.